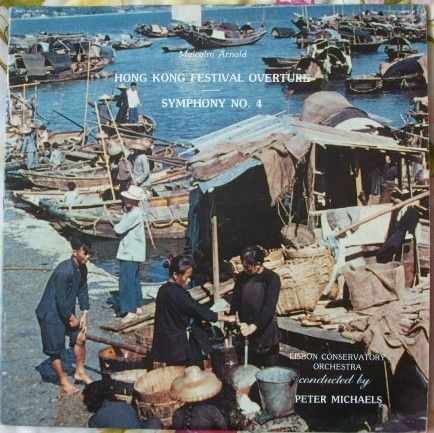 33rpm LP Record of HONG KONG FESTIVAL OVERTURE & SYMPHONY NO 4, by Malcolm Arnold, featuring the Lisbon Conservatory Orchestra conducted by Peter Michaels. It was issued on the Stereo Aries Records label. Catalogue number: LP-1622 USA pressing. The record itself is graded at least excellent, with just the odd surface mark visible when viewed under normal house lighting. Play-tested on a USB turntable. Superb sound quality, with NO jumps, ticks or crackle and just an occasional dust pop. Otherwise more or less faultless playback. Minimal to no spindle wear. Labels clean, very faint spider marks. The card outer sleeve is graded a strong very good, with no more than light wear (faint ringwear, light bumping to corners/rubbing to edges). The spine is intact and strong with just a bit of scuffing in the top half. The inner sleeve has a couple of short tears.